It is somewhat unlikely that you will randomly wake up one morning to teenagers who love to help, are clean and tidy and willingly assist you keep the home running smoothly. It is even less likely if you never taught them to help around the house when they were little. Training them young isn’t going to guarantee results but it sure ups the odds. Either way, at least you will have helpers in the short term. 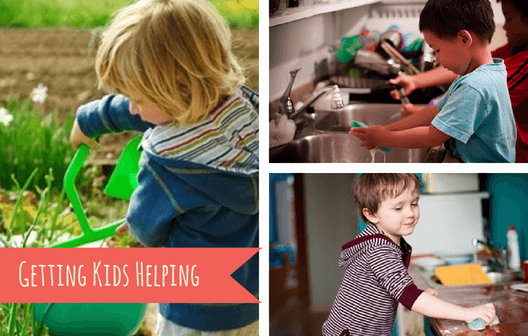 Here are some ideas for getting kids to help around the house. They are grouped by age. Do you have any other tips for getting kids to help around the house? Absolutely love these job lists & going to try them with my cherubs! Have also stolen your bucket suggestion in a different post to make tidying my living space (with 3 children five and under!) much simpler! LOVE! Thankyou!